Above: A premium quality Royal Green Plecostomus swimming in one of our aquariums. Origin: This Plecostomus was caught in the streams and rivers in Colombia, Venezuela, and Brazil, in South America. Maximum Size: This Plecostomus can grow to be about 17" long, including their tails, which is very large. 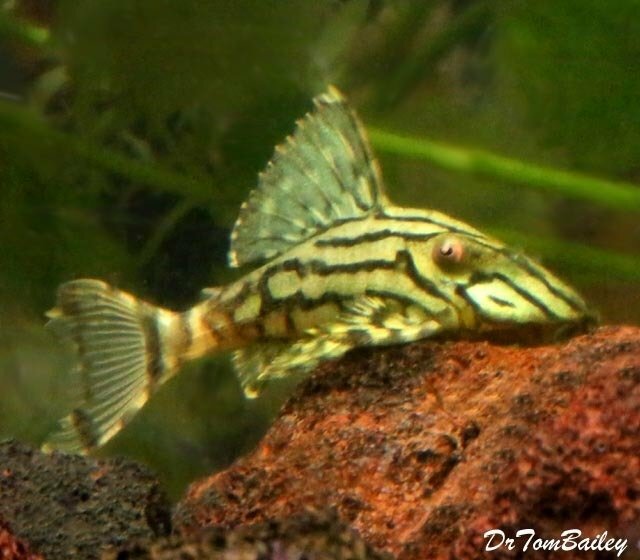 Behaviors: These Catfish are semi-aggressive toward other Plecos, especially of their own species. Water Conditions: This Plecostomus seems to be tolerant of a wide range of water conditions. Probably a pH of about 6.5 with moderate hardness is best. Aquarium Size: It's probably best to house these fish in at least a 60-gallon tank, when they're less than 6" long, but a bigger aquarium is necessary when they start to grow. At about 6" they should be moved into a 100-gallon aquarium. Eventually they'll need a much bigger aquarium. These Plecos eat driftwood, so it's a necessity to have some Aquarium Driftwood in the tank so they can graze on it as part of their diet. At 3" long they should be moved into a 60-gallon aquarium with two Penguin 350B Filter. Eventually this species will need a much bigger aquarium. Names: The scientific name is Panaque nigrolineatus with L-number, L-190. Variations: This Plecostomus lives across a wide range in in northeastern South America, and there are different variations.